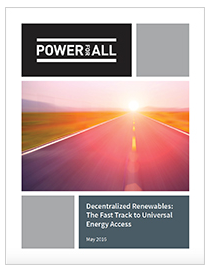 The Executive Summary from ‘Decentralized Renewables: The Fast Track Track To Universal Energy Access,’ is republished with permission from PowerForAll. Please visit their resource page for more resources and to download the full paper. The international community is united by a global mandate and moral imperative to deliver, in just over a decade, affordable, reliable, sustainable, and modern energy access to the billions of people who live in energy poverty. Ranging from the African Development Bank’s commitment to end energy poverty by 2025 to the United Nations’ Sustainable Development Goal 7 (SDG7) targeting 2030, energy is universally recognized as central to nearly every major challenge and opportunity the world faces today. The UNFCCC Paris Agreement, with an initial 177 signatories, acknowledges that renewable energy should be deployed to achieve universal energy access and climate mitigation. Despite energy access commitments from governments and the world’s most influential institutions, business-as-usual energy delivery will not achieve global goals to end energy poverty by (or before) 2030. In fact, based on current trajectories and conventional approaches—which include an abundance of 20th century technologies, like centralized energy—predictions are that there will be more energy poor in 2030 than there are today. Hindered by legacy frameworks that slow the pace of change, many of the same institutions that have heralded SDG7 are actually limiting the ability of the global efforts to quickly address the costs of energy inequality. While a number of players—civil society, governments, entrepreneurs—are critical to re-balancing this equation, multilateral development banks (MDBs) are uniquely positioned to accelerate energy access. The MDBs—including WBG, AfDB, ADB, IADB —are expressly designed to catalyze poverty alleviation. However, MDBs’ common approach to energy access often overlooks the unique ability that decentralized renewable energy (DR energy or DRE) enterprises have to radically alter the access timeline. Decentralized energy like mini-grids and solar home systems are viable options to economically deliver fast, efficient energy access in areas where centralized grids are slow and prohibitively expensive to deploy. Studies have identified the inadequate levels of MDB support for quickly deployable, decentralized renewable energy access (see Table 1), especially when compared to MDB support for traditional “steel in the ground” power, as a cause of slow electrification progress. While these studies evidence under-investment by MDBs, there is another critical factor: the energy access opportunity cost. This missing link between pace of funding and speed of access means many projects invested in by MDBs actually hinder efforts to meet global goals for electrification. Current approaches that prioritize slow-to-build, unreliable grids over quickly deployed DRE mean countless children lose educational opportunities, hundreds of thousands of businesses are less productive, and health clinics serve millions inadequately. The opportunity costs of delaying energy access can be remedied if MDBs and infrastructure development agencies incorporate into their plans the full spectrum of energy options available today, including DRE systems. To this end, Power for All calls on MDBs to (1) place value on the lost opportunity of delayed energy access, (2) speed the pace of sector investment through “super funds” of aggregated capital dedicated to DRE, and, (3) catalyze dedicated national energy access vehicles to address the deployment gap between MDBs’ “wholesale capital” (large transactions) and the “retail capital” (smaller, diverse transactions) that will support the DRE sector, and radically accelerate the access timeline. 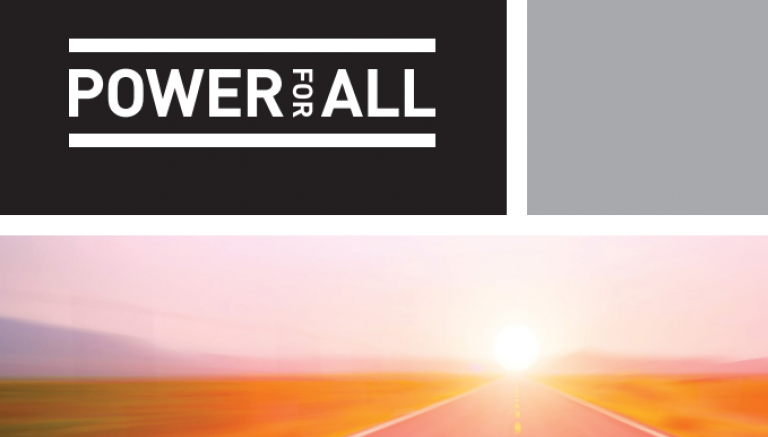 Power for All is a global campaign to accelerate the deployment of market-based, decentralized renewable energy as the key to achieving universal energy access. The campaign serves as a collective voice for businesses and civil society focused on distributed renewable solutions, including decentralized solar, hydro, biomass, and wind designed for households and businesses. Learn more at powerforall.org.